I saw one of those Food Network stars making burgers last week and I saw one tip you have to try. 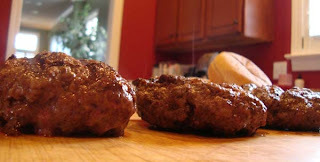 The chef claimed that when you make your own hamburger patties of ground beef for grilling you could use his trick to keep the thick – disk shaped – patty from turning into a fat – ball shaped – patty. 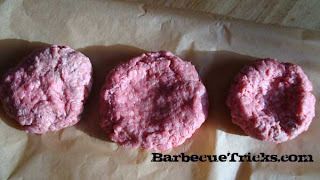 The advice is to make your patty with an indentation in the center (see photo). That way when the center of the beef patty swells or plumps when you grill it, the burger will revert back to a normal / flatter patty shape that will nicely accommodate a soft bun. Simple enough. We tried the technique in the BBQ test kitchen and must say were surprised at how well the “indentations” on the test patties disappeared. We probably could have made the dent evendeeper (or on both sides). The control patty (“test” or “not concave” is on the left in the photos) indeed DID expand in the middle… But honestly not enough to bother me. Another recommendation would be to control yourself and keep from pressing the burger down on the grill with the spatula. I don’t know why guys do this but I see it done all the time. All-in-all the tip is worth while and is good general practice for the next time you’re pressing patties. You want to go barbecuing, therefore you start preparing. The list in your mind or on your paper should include the grill, the meat, the corn on the cob if you are in love with it, and of course the grill seasoning. Some people prefer to grill their meat after having added to it only pepper and salt as the flavor of grill seasoning mixtures takes the deliciousness of the barbecue away, they say. Others however, can not have a barbecue without the grill seasoning as, having gotten used to it, they consider the meat cooked without it tasteless. There is a great number of recipes for the grill seasoning, each to appeal to various types of people and each to go with a certain kind of meat. The shelves in supermarkets are full with bottles of seasonings and mixtures of spices and herbs, yet many people prefer to make their own grill seasoning at home. One reason for this is that these seasoning bottles contain a lot of unhealthy ingredients which, even though make the meat very tasty, should not get into our habit of regular buying. However, if you insist on buying grill seasoning, then checking for additives and unhealthy ingredients before going to the store would be a good recommendation. The next one would be to read the label, check what the main ingredients are and also avoid choosing from the cheapest of the products. 1. Pepper 2. Salt 3. Onion 4. Garlic powder 5. Coriander 6. Red pepper flakes. Recipes are all over the internet nowadays so it will be much cheaper for you to Google search than to buy recipe books. The recipe mentioned above is very simple and it very much resembles what you usually add to a nicely home made steak. Usually when making a steak at home, you want it to have the best of flavors. And of course you tend to add garlic and onion at least beside the salt and the pepper. As for storing the grill seasoning, they recommend keeping the mixture of spices in an airtight container and in a place that is not very warm. In case you follow this tip, you will ensure that your grill mixture will preserve all its qualities for the next-to-come grill.